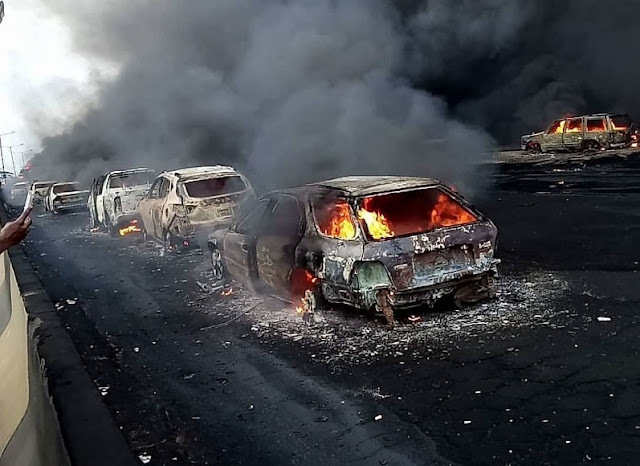 A survivor of the fatal fuel tanker accident that occurred on Otedola Bride, Lagos-Ibadan expressway has shared his views about what led to the explosion and why so many people died. Writing on Twitter, the victim alleged the accident was not the tanker's fault. He also attributed the death of victims of the incident to "foolishness". According to the man who claimed he lost his phone in the incident, a commercial bus had dropped off a passenger where there was no bus stop and immediately tried to get back on the lane without looking at his side mirror. "I lost my phone to that Berger tanker accident yesterday. First of all, it wasn’t that tanker driver's fault. A commercial bus dropped off a passenger where there was no bus stop and entered the fast lane back without first looking at his side mirror. The tanker guy tried avoiding the accident but look at what happened at the end. He stepped on his brakes, hit the partition and tripped over! Now here is the part that got me really mad. Ignorance killed all the people that died. That tanker didn’t explode immediately. People had minutes to save themselves. Every minute counts in an accident like this, but instead people were trying to save their cars instead of their lives. There was a Camry right in front of the tanker and the man was actually trying to reverse his car. That's a foolish thing to do. Save yourself and salvage the car later! Fire and electricity are like the same. People were in their cars making videos instead of running away. Finally the fire started and panic sets in. I watched as people got burnt. It became a struggle contest -- who’s going to come out first, while the fire rounded them up. What they should have done first, the did it last and payed with their lives. May their souls rest in peace. But I'd say foolishness killed those that died on that bridge. May God forgive all their sins and grant them eternal rest." The tweets were slightly edited for minor errors.